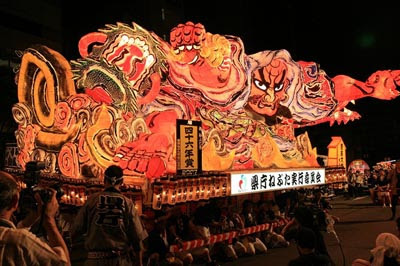 Nebuta are illuminated floats which are paraded through the town in Aomori and other cities in Northern Japan. The Nebuta Festival in Aomori is held in the beginning of August. There are many theories about the origin of the Nebuta Festival. One is that it originated with the subjugation of rebels in the Aomori district by "General TAMURAMARO" in the early 800's. He had his army create large creatures, called "Nebuta", to frighten the enemy. Another theory is that the Nebuta Festival was a development of the "TANABATA" festival in China. One of the customs during this festival was "TORO" floating. A "TORO" is a wooden frame box wrapped with Japanese paper. The Japanese light a candle inside the "TORO" and put it out to float on the river or the sea. The purpose for doing this is to purify themselves and send the evil spirits out to sea. "TORO" floating is still one of the most impressive and beautiful sights during the summer nights of the Japanese festivals. On the final night, "TORO" floating is accompanied by a large display of colorful fireworks. This is said to be the origin of the Nebuta Festival. Gradually these floats grew in size, as did the festivities, until they are the large size they are now. Today the Nebuta floats are made of a wood base, carefully covered with this same Japanese paper, beautifully colored, and lighted from the inside with hundreds of light bulbs. In early August the colorful floats are pulled through the streets accompanied by people dancing in native Nebuta costumes, playing tunes on flutes and drums. Many Aomori citizens are involved in the building of these beautiful floats. 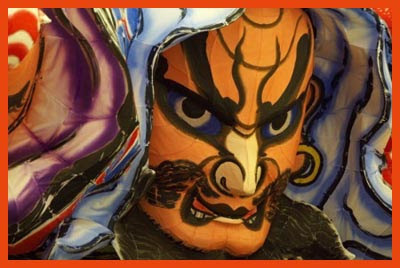 The Nebuta designers create their designs patterned after historical people or themes. They begin developing themes immediately after the previous year's festivities come to a close. 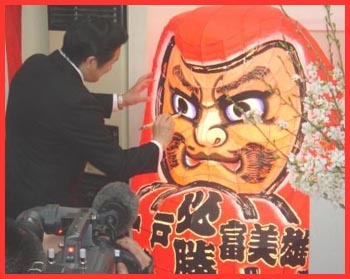 Consequently, it takes the entire year, first in the development, then in the construction of the Nebuta float. One of the reasons for the popularity of the Nebuta festival is that onlookers are invited and encouraged to participate. The sounds of the Nebuta drums and bamboo flutes inspire people to prepare costumes and begin practicing the Nebuta dances. As the beginning of the parade is signaled, "HANETO"(dancers) join hand-in-hand, and start their journey through the streets of Aomori. These dancers, colorfully arrayed in Nebuta garb, welcome audience participation. Feel free to join in a circle and enjoy the festivities! We, the citizens of Aomori, would like to pass on this wonderful festival to our sons and daughters, in hope that it becomes a symbol of peace and hope to the coming generations.
. Folk Toys from Aomori . In Japanese , NEMU NO KI　ねむのき　合歓の木 is the name most commonly used for this tree, but in former days NEBU NO KI, NEBURI NO KI or NEMURI NO KI were used. These all mean the same thing- THE SLEEPING TREE, when directly translated. Now because of this SLEEP-LIKE behaviour, and its name ( formerly NEBU NO KI), the Japanese of old, used the leaves of this tree in a once common SUMMER RITUAL which was meant to drive away the SLEEPINESS ( NEMUKE 眠気) brought on by Japan`s hot season. This often took place on the morning of Tanabata ( the 7th day of the seventh month on the old calendar) and was called Nemuri Nagashi or NEBUTA NAGASHI ( literally- washing away sleepiness). What happened was that when one woke up on the morning of the ritual, one rubbed the leaves of the nemu tree on ones eyes, symbolically wiping away fatigue. These same leaves were then tossed into a stream or river to be carried away, along with the bad energies which had been wiped away and absorbed. Over theyears this ritual developed into much more elaborate summer festivals which were celebrated with the intention of reviving the people energies during th hot and LAZY season. In many parts of North-Eastern Japan these festivals are still celebrated, with the most famous being the NEBUTA FESTIVAL of Aomori City. With tremendous crowds goig wild and its huge lanterns representing heroes of yore this festival is one of the great annual events IN THE WORLD. wird vom 2. bis 7. August in der Stadt Aomori gefeiert, der nördlichsten Großstadt auf der Hauptinsel Honshu. Es hat sich aus einem Tanabata-Sternenfest entwickelt und wird wie das Laternenfest in Akita entsprechend dem Mondkalender begangen. Nebuta bedeutet „schläfrig sein“. Man wollte die müden Seelen aufwecken, weil die Ernte kurz vor der Tür stand. Eine andere Legende geht auf das 8. Jahrhundert zurück. Der General Tamura Maro soll mit derartigen Riesenlaternen die Feinde so erschreckt haben, dass er einen leichten Sieg errungen hat. Die riesigen Laternen aus Bambus und Japanpapier werden auf Wagen montiert und in einer nächtlichen Parade durch die Stadt gezogen. Das Herstellen der Laternen nimmt die Bewohner der Stadt das ganze Jahr über in Anspruch; das Fest ist der Höhepunkt ihrer Bemühungen. Bis zu 50 Männer wechseln sich beim Ziehen eines Festwagens ab und die anfeuernden Rufe hallen von 17.30 Uhr bis 21.00 Uhr durch die Stadt. Zwischen den Laternen tanzen Frauengruppen in bunten Gewändern, hier können sogar Touristinnen mitmachen, wenn sie sich ein geeignetes Kostüm in einem Geschäft ausleihen. 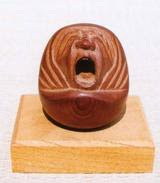 Die Dekorationen auf den Laternen zeigen beliebte Figuren aus der Legende und Geschichte Japans, grimassenschneidende Kabuki-Schauspieler oder muskelstrotzende Kriegshelden. Sie werden mit dicken schwarzen Umrissen auf Papier gemalt und mit grellen Farben ausgepinselt. Am Abend kommen sie dann durch zahlreiche Lämpchen in ihrem Inneren zum Leben. Einige Handwerker der Stadt haben sich sogar auf die Herstellung der Nebuta-Laternen spezialisiert. Die Parade zieht an jedem Festabend über 2,5 Kilometer durch die Innenstadt, wobei bis zu 20 Laternen vorgestellt werden. Am letzten Tag sind alle unterwegs und die Laterne mit der besten Dekoration wird gekürt: Sie darf auf einem Boot durch den Hafen von Aomori fahren, und ihre Hersteller sind die Helden des Tages.
. kingyo nebuta 金魚ねぶた（きんぎょねぶた）goldfish as nebuta toy . They basically jump two times on the right foot and two times on the left, for about 2 hours during the long parade! This is not a dance, but a jumping performance.
. haneto ningyoo はねと人形 Haneto "jumping" dancer doll . Another great translation and what a wonderful pic. Thank you for the link about the festival. I enjoyed reading about it. More than 20 Nebuta dancers from the northern Japanese prefecture of Aomori have given a special performance for evacuees from disaster-hit Fukushima Prefecture. Nebuta is one of the most popular festivals in Japan and features a parade of giant paper floats. The dancers visited temporary housing in Matsukawa Town, Fukushima City, on Sunday. Aomori Mayor Hiroshi Shikanai accompanied the group. About 450 evacuees from Iidate Village moved to the housing complex after the accident at the Fukushima nuclear power plant. More than 80 percent of the residents are elderly people. The residents were able to enjoy a traditional Japanese festival for the first time since leaving their hometowns. Some of them joined the dancers in the square. One of the residents, a 63-year-old woman, said she enjoyed the dance and it was good for relieving stress. She said she wants to visit Aomori and see the real Nebuta festival someday. painting for a Nebuta float.